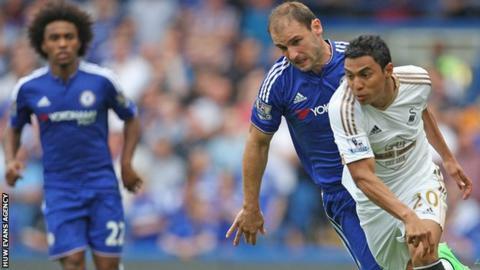 Swansea City manager Garry Monk said the 2-2 draw with Chelsea gave an early glimpse of his side's attacking threat. The Swans twice came from behind against the reigning Premier League champions with goals from debutant Andre Ayew and Bafetimbi Gomis. Monk said: "I thought for 90 minutes we were excellent. We really competed. "I set the team up to be offensive today to try to showcase the talent we have in the squad and I thought we did that for 90 minutes." Ayew was Swansea's marquee signing of the summer, arriving on a free transfer from Marseille with a stellar goal-scoring reputation and international experience. He showed technique, balance and composure with a deft drag-back and finish to bring the Swans level six minutes after Oscar's opener for Chelsea. "He's come in and been incredible," added Monk of the 25-year-old Ghana international. "He's worked extremely hard with the group and the group have worked hard with him to make him feel settled and it's always good when your a new player in a new league to get that first goal. It will give him great confidence." On the opposite flank, Jefferson Montero gave Branislav Ivanovic a torrid time, while Jonjo Shelvey stood out in midfield with searching balls behind the Chelsea back four. One such pass resulted in Swansea's second goal when home goalkeeper Thibaut Courtois brought down Gomis after the Swansea striker won the race to the through ball. Courtois was sent off and Gomis scored from the penalty, cancelling Chelsea's fortunate second on 30 minutes as Willian's cross deflected off defender Federico Fernandez and looped over goalkeeper Lukasz Fabianski. "I wanted to get on the front foot and I thought we did that more times than not," said Monk. "When we had to defended we did that really well. The two goals were freak goals really, especially that second one but I thought we reacted well. "So I thought we were excellent. I thought the best chances of the game fell to us - we had some very good chances - and we always looked dangerous and got the result we deserved." Chelsea manager Joe Mourinho refused to give an opinion on Michael Oliver's decision to show Courtois a red card, but Monk felt there was no room to question the referee's call. "Bafe would have a goalscoring opportunity had the keeper not come out at that point," he said. "The keeper takes him down inside the area so it's a definite penalty an obviously a red card." Montero, who was at the Copa America tournament in Chile for Ecuador in July, came off with cramp towards the end and Ki Sung-yueng departed with a hamstring strain. Monk, though, expects both to be ready to face Newcastle at home next Saturday. And the manager added: "This result should give the players confidence but we know in this league you can get bitten badly in any situation so we have to be focused. "It's an excellent start. It's a confidence boost to the players to come here and perform like that and we need to take that into the rest of the season."